An increasing number of cities in the U.S. are providing rain barrels at low or no cost to their constituents in order to promote the practice of rainwater harvesting. For many of these locations, the driver is the support (and funding) of the E.P.A which has made the reduction of stormwater from cities a top priority. The most common type of rain barrel oferred is the repurposed 200 liter food container- which incidentally is the same type of storage RainSaucers is designed to work with. But some cities such as Oakland, CA subsidize brand new barrels. 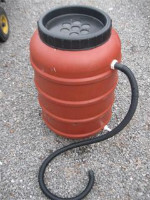 Major cities on the West Coast with rain barrel subsidy programs include Seattle, San Francisco, and Los Angeles.